What makes us different to other Sydney headshot photographers? Valent Lau Photography is an AIPP Accredited Professional Photographer with a fully equipped studio capable of producing a range of looks for your photograph. Every session includes a full consultation for us to fully understand your business, its position in the market, and the brand it is trying to portray to the world. Together we craft your image based on not what we want to make, but what we want the viewer, your potential clients, to see. This makes them much more receptive to the message you give. We tailor your photograph to work with your website and collateral, to give a consistent and professional message. Your profile photographs are the best version of you, but are still you. Your clients will instantly recognise you from across the room at a business event. The most important part of getting a business profile photograph is understanding the requirements. The first step is to get in touch so that we can explore what it is that you and your business is offering to the world. What makes you different? Where will these photographs be seen? Can they pop out without being overwhelming? What makes us different is that we don’t take everyone and put them through the cookie cutter. We only take you on as a client after we’ve fully understood you and your market, and can come up with a plan to create something amazing for you. Valent Lau Photography is a fully AIPP Accredited Professional Photographer capable of producing a wide range of looks to show off your brand both in studio and at your location. Being AIPP doesn’t magically make us a better photographer, but it means we subscribe to a strict code of ethics and are willing to stand behind it. It’s all for your peace of mind. What kind of professional branding do you do? Professional/personal branding is how you market yourself to the world. 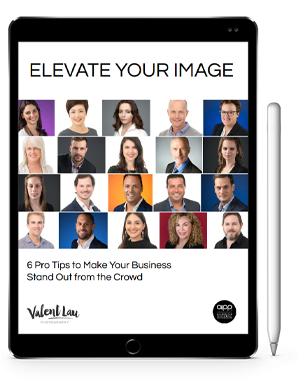 Whether you are after a standard headshot to use on business websites or professional profiles, or you are after something more dynamic to leave a mark, your photograph must convey the who and why to your potential clients. In the age of information, trust is king. Your clients buy you as much as your offerings. Does your brand say you are capable and trustworthy? What kind of website photography do you do? Eye tracking research by Google has shown clients essentially ignore stock photos. Replacing a stock photo with a genuine one can increase conversions on that page by 35-45%. A friendly photo may be that push your client needs to fill in the contact form. We come to your location to capture a series of photographs of you and your staff in action and in your natural environment. Your clients become familiar with your office and get a feel of what it’s like to work with you. The result is that you have a library of high quality imagery to use across your website and future online and offline marketing materials. How often should I update my profile photograph? A good head and shoulders headshot can last for 2-3 years. More active professionals update yearly to keep their brand fresh and dynamic. Personal branding photographs, however, also paint a picture of your work style and direction. Whenever your direction changes, it is important to update your branding photographs to maintain a consistent message shown to your clients. Should I get hair and makeup done for the headshot? Absolutely. This makes a big difference to your final photographs. Our clients usually have professional hair and makeup done. We can give you recommendations for mobile hair and makeup artists who can give you professional results in the comfort of your own home. Where can I get my photographs done? Depending on the type of headshot or profile image required, there are different options. We can shoot at our studio in South Coogee, at your place of business, or in an outdoors location. Call us to discuss your needs. We include natural fine touch retouching on branding photographs. Small blemishes are removed, bags under eyes reduced, and subtle skin smoothing performed to make you look your best, but still you. The result are photographs that look wonderful, and so natural people think they haven’t been retouched. More extensive retouching such as face sculpting, compositing photographs, are available at extra cost. What should I do to prepare for my photographic session? Leave it to us! We will help you every step of the way. What happens after my photographic session? On the same day together we will go through the photographs and select your favorites to purchase. Once selected, we will retouch those photographs and deliver them online within 3-5 business days. What resolution are the photographs I receive? Standard packages include images in high resolution for printing up to 8×10″. We also provide resized photographs in medium and profile size, so you can use them for social media and business websites right away. Image files for printing in larger sizes available at extra cost. Do I get my photographs in color or black & white? We create your portraits in full color by default. If you need, we can create individually handcrafted black & white versions for a small fee. These are made according to the important tones of each photograph and are of excellent quality compare to automatic conversions. What if I need my photographs urgently? A rush service may be available depending on other workload. Ask us for more information. How may I use the photographs? Standard packages include a licence for self-promotional uses such as on websites, flyers, and within business premises which are perfect for 99% of our clients. A separate licence may be negotiated for extra uses including but not limited to product packaging, book covers and TV advertising use. Contact us to discuss details. Valent Lau Photography is based in South Coogee in the Eastern Suburbs, and serves the Sydney region. We have clients from many areas in the Eastern Suburbs including Coogee, Maroubra, Malabar, Randwick, Clovelly, Bronte, Waverly, Bondi, Point Piper, Potts Point, Rushcutters Bay, Elizabeth Bay, Double Bay, Bellevue Hill, Rose Bay, Dover Heights, Vaucluse, Watsons Bay, Woollahra, Kensington, Kingsford, Centennial Park, Paddington, Darlinghurst, Moore Park, Tamarama. We also service the North Shore, Northern Beaches, Forest District, Northern Suburbs, Inner West, and other areas. Have a think about what message you want to convey to the world. Contact us to discuss and explore options.